* This story was the result of a joint project of the Michigan Campaign Finance Network and Bridge Magazine. To read more about it, go here. LANSING — Eric Leutheuser is a state representative and an auto dealer, two careers that intersected in a May meeting of the House Regulatory Reform Committee. The committee was considering a bill Leutheuser sponsored to require the state to offer and pay for certain training programs for auto dealers. Rep. Ken Yonker, R-Caledonia, the committee’s vice chair, questioned why taxpayers should have to pay for such industry-specific training. An official with the Secretary of State’s Office, which offers the training, replied that Michigan expects auto dealers to comply with rules, and the training programs would help them do it. As it happens, Yonker, whose official House biography says he owns a landscaping business, had proposed a money-saving policy for his own industry in 2013. A bill he sponsored would have dropped licensure requirements and fees for landscape architects (It died in committee without a vote). Welcome to the Michigan Legislature, where there is no law barring lawmakers from voting on bills that could financially benefit their businesses or families. 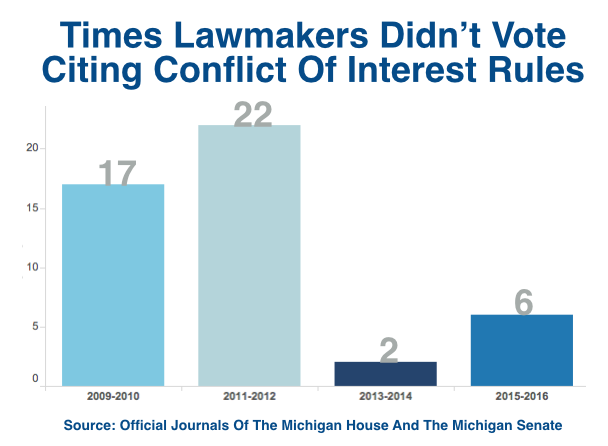 While 32 states have statutes regulating conflicts of interest — some requiring disclosure; some barring members from casting votes — Michigan relies on House and Senate rules enforced by the lawmakers themselves, with predictable results. A state senator telling a hometown newspaper he couldn’t vote on a bill that came to the Senate floor because it would give his daughter, a judge, a raise; then voting yes on the same bill when it returned to the Senate. Spokespeople for state legislative leaders contend that conflicts of interest are taken seriously in Lansing and that — with or without a conflict-of-interest law — lawmakers are doing a good job avoiding them. But some current lawmakers dispute that, with one calling the practice “fairly rampant” in Lansing. “It’s an honor system without honor,” said Chad Selewski, a Michigan journalist who analyzed Michigan’s conflict of interest policies for the Center’s 2015 national report. Michigan Senate rules say that senators can’t vote on matters in which they have a “personal, private or professional interest.” But a Senate “rule” isn’t the same as a state “law”; there is no set penalty for violating a Senate rule. Moreover, it’s not clear when, if ever, a lawmaker has been sanctioned by his peers for violating the conflict-of-interest rule. In the Michigan House, the rules hold legislators even less accountable, simply stating that House members have the option of declaring a conflict of interest as a reason they can give for not voting. Even with these lax policies, records reviewed by the MCFN and Bridge indicate that the rate at which state lawmakers recuse themselves from voting has declined sharply in recent years. Whether that’s because lawmakers are doing a better job avoiding conflicts, or are less inclined to report them, is unclear. From 2009 to 2012, lawmakers in the House and Senate recused themselves from voting 39 times, citing conflicts of interest, according to official legislative journals. Since then, conflict-of-interest recusals have dropped roughly 80 percent – with lawmakers citing a conflict of interest as a reason for not voting just eight times in more than 4,500 roll call votes from January 2013 through Oct. 21, 2016. In addition, Michigan makes it difficult for residents to learn if their legislators have a financial conflict of interest on certain issues. Michigan is one of only three states that don’t require some level of personal financial disclosure from state lawmakers. Financial disclosure forms used in other states (and in Michigan by those running for federal office) require lawmakers to reveal the source of their income and investments. Currently in Michigan, the public only knows those things about legislators if individual lawmakers voluntarily reveal them. But a variety of legislative leaders say the public has little reason for concern. Examining lawmakers’ official biographies and their sponsored bills, Bridge Magazine and the MCFN found more than a dozen instances in which lawmakers sponsored or backed bills that appeared to be related to their career fields outside of the Legislature, or to the career interests of a family member. Rep. Mike Callton, R-Nashville, said it’s common for Michigan lawmakers to vote on – and even write – bills for which there is an appearance of a conflict of interest. Callton has done so himself, the legislator admitted. Callton, a chiropractor, voted in 2015 in the House Health Policy Committee on a bill that would allow chiropractors to prescribe physical therapy. The bill can be viewed as a way to help chiropractors maintain ties with patients seeking physical therapy; currently, a chiropractic patient who needs physical therapy must go to a physician to get a prescription. The bill is opposed by groups ranging from the Michigan Physical Therapy Association to the Chamber of Commerce to Blue Cross Blue Shield of Michigan. The only group that testified in favor of the bill: the Michigan Chiropractic Association, which named Callton the organization’s Chiropractor of the Year in 2013. The bill was approved by the House Health Policy Committee in June, with Callton voting yes, and is awaiting action on the floor of the House. Callton conceded “it’s valid” for the public to view his committee vote as a possible conflict of interest, but said there “isn’t a culture” of recognition of conflict of interest among lawmakers. Jane Briggs-Bunting, president of the Michigan Coalition for Open Government, a nonprofit government watchdog group, said the appearance of such conflicts damages public trust in state government. Because lawmakers in Michigan don’t have to file financial disclosures, it’s impossible to know all the potential conflicts that may arise in their legislative activities. For instance, this fall, lawmakers are crafting wide-ranging energy policies. But under the state’s lax financial disclosure laws, there’s no way to know how many lawmakers have financial investments in utility companies with stakes in the bills. One lawmaker, Rep. Earl Poleski, R-Jackson, whose wife works for Consumers Energy, said his family has a small financial investment in the utility. Another House member, Gretchen Driskell, D-Saline, has investments in CMS Energy, the parent company of Consumers Energy. That information only came to light because she is currently running for Congress. Candidates for federal office are required to file the kind of financial disclosure report not required of state lawmakers. Michigan has “full-time” legislators who earn $71,685 per year, but many also have outside jobs or professions. Some who leave their fields to work in the legislature return to their professions after they leave Lansing. That has happened at a higher pace in recent years because representatives are limited to serving six years (three two-year terms) and senators eight years. (two four-year terms). Those professional ties, along with the professional and financial ties of spouses, can create at least the appearance of a conflict when they sponsor or vote on a bill. But some lawmakers caution that just because a bill impacts their career fields doesn’t necessarily mean there is a conflict of interest. Multiple legislators said they view true conflicts of interest more narrowly, saying they believe their vote only raises an ethical issue when the measure could give them a direct financial advantage over others. Rep. Edward Canfield, R-Sebewaing, who’s in his first term, said it’s natural — and preferable — for lawmakers to enact laws that improve their own professional fields. “We need to bring our expertise,” said Canfield, a physician who has sponsored bills that would affect physicians. The tension between lawmakers lending their expertise to a bill and potentially benefitting from its enactment can be seen in two recent bills Canfield sponsored. The measures would eliminate requirements that doctors maintain their national and regional certifications to get insurance reimbursements. Canfield said he sees too many doctors leaving the profession out of frustration from having to take too many certification tests. The decline in lawmakers citing conflicts as a reason not to vote comes at a time when trust in state government is low, and dropping. Just one-in-five Michigan residents say they trust state government “most of the time,” according to the 2015 Michigan State University State of the State survey. Trust levels have dropped by about 50 percent since 1995, according to the MSU survey. There are 32 states with statutes on lawmakers and conflicts of interest. The National Conference of State Legislatures lists how each state regulates when lawmakers must refrain from voting. Some states, such as Alaska and Florida, have ethics commissions that field complaints about legislative conflicts of interest and serve as an advisor and referee to lawmakers when they aren’t sure if they should abstain from a vote. In Michigan, by contrast, the legislative bodies are expected to police their own members. Only once this session has a senator cited a conflict of interest as the reason for not voting, and even that instance highlights how ineffectual the rule can be. In March of last year, Sen. Darwin Booher, R-Evart, declined to vote on a bill that could raise salaries for judges because his daughter, Kimberly Booher, is a circuit court judge in Mecosta County. But when the bill later returned to the Senate from the House, Booher voted in support of the proposal. When asked about the flip-flop, Sen. Booher’s office issued a statement explaining Booher decided to vote on the bill after reviewing the Senate rule on conflicts of interest. Selewski, who wrote the Center for Public Integrity report on Michigan, said he sees holes in the current rules. Rep. David LaGrand, D-Grand Rapids, is one of a handful of legislators this term who have declined to vote on a bill because of a conflict of interest. LaGrand is a licensed building contractor, and he declined to vote on a measure that would make it easier for homeowners to hire unlicensed contractors. The bill passed. LaGrand, who joined the legislature this year, said there was “a nice orientation (for new lawmakers) on sexual harassment, but nothing on conflict of interest. “I don’t think most legislators understand the issue,” he said. “Unless you happen to come from a background where a conflict of interest is common, then you don’t think about it. Callton, the Nashville representative and chiropractor, said he feels pressure to vote on every bill, whether there is a potential conflict of interest or not, to maintain a 100 percent voting record. Missed votes, Callton said, can be used against legislators in reelection bids. Indeed, missed votes have declined sharply since 2001, when the Mackinac Center for Public Policy, a free-market think tank, began publishing the voting records of individual legislators. 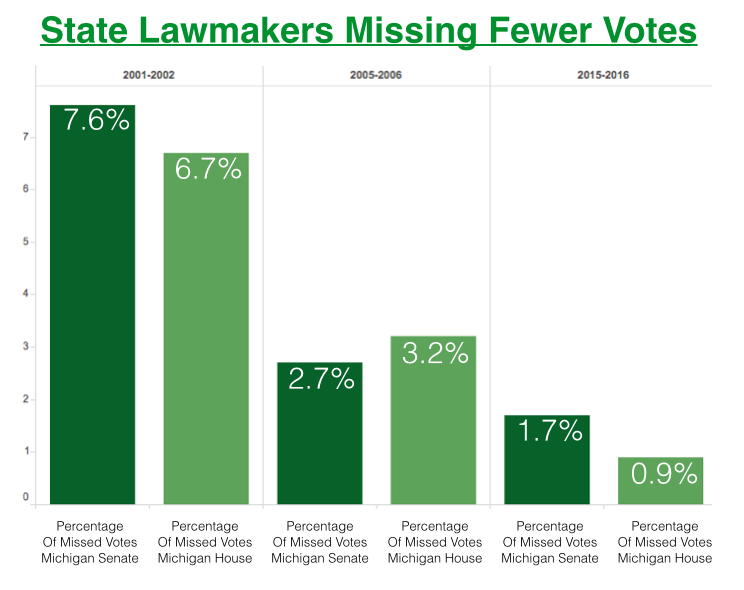 In 2001, state senators missed 7 percent of votes and House members missed 6 percent. This term, which includes sessions in 2015 and 2016, senators have missed just 1 percent of votes and House members 0.6 percent, according to data compiled by the Mackinac Center. Katie Carey, spokesperson for House Democrats, said members are advised to cite a conflict of interest “when there is a specific benefit or direct economic impact to them,” but agreed that lawmakers are feeling more pressure to cast votes from social media and constituent correspondence. “If someone doesn’t, they are criticized for not doing their job or silencing 90,000 residents of their districts,” Carey said. Jack McHugh, who operates MichiganVotes for the Mackinac Center, said he doubted voting record pressure explains why lawmakers appear to be less likely to refrain from voting on issues in which there is clear conflict of interest. “I can understand a politician being a little bit sensitive about that, but they also get to look like a statesman,” McHugh said. Sen. Curtis Hertel, D-Meridian Twp., is a member of the Senate Appropriations Committee’s Health and Human Services Subcommittee, which works on the budget for the Department of Health and Human Services. Hertel is a former employee of the Department of Community Health, which is now part of the Department of Health and Human Services. Hertel’s wife, Elizabeth, is director of policy and legislative for the Department of Health and Human Services. Hertel said the situation isn’t a conflict of interest because he makes voting decisions independently and isn’t biased by his ties. He said his constituents wouldn’t be surprised he’s working on health care related matters because he’s passionate about them and he’s not afraid to disagree with his wife. “I don’t mind sleeping on the couch if it means I’m right,” Hertel said. Sen. Steven Bieda, D-Warren, is a co-sponsor SB 194 which would require legislators to file financial disclosure statements similar to reports filed by candidates for Congress, and state legislators in some other states. Having a public record of jobs and financial entanglements would allow the public to know if their legislators have a financial interest in legislation, Bieda said. The bill is awaiting a hearing in the Elections and Government Reform committee of the Senate.